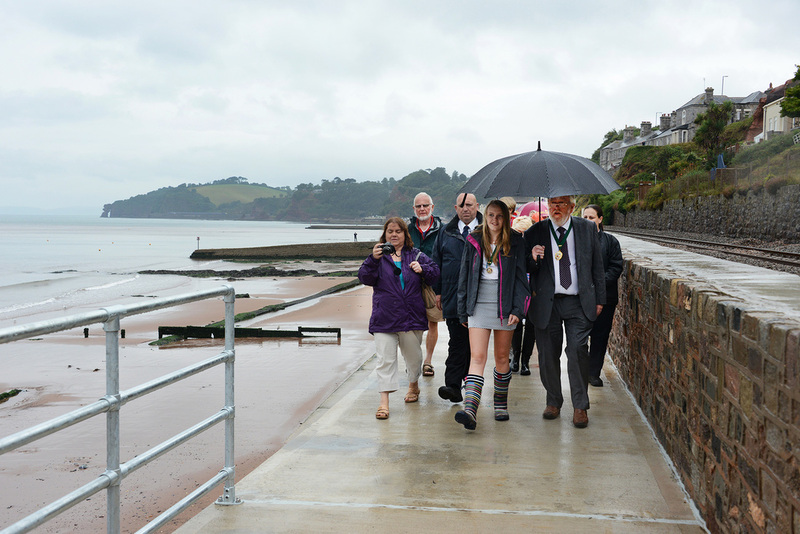 Bristol? 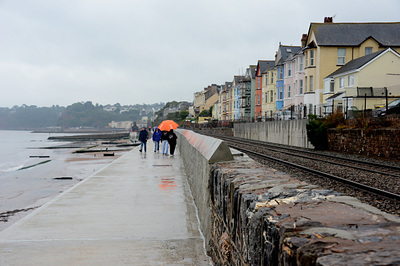 No - Dawlish. 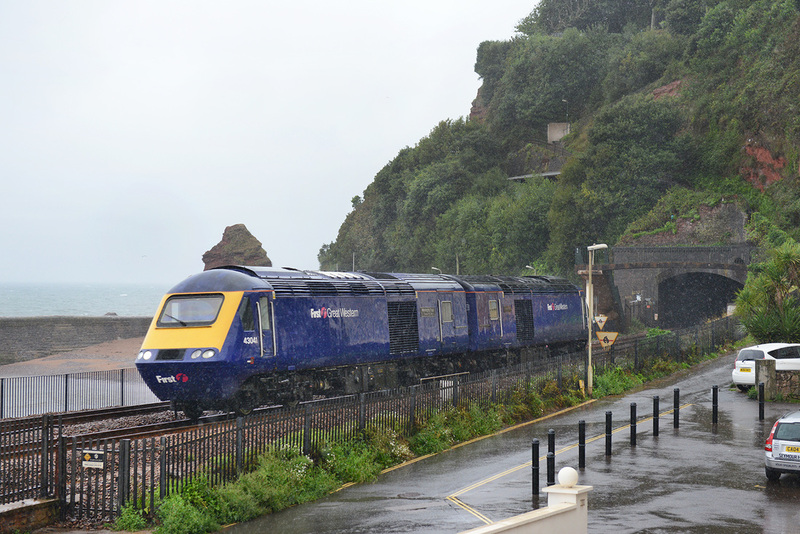 43126 'Bristol 2015 European Green Capital' emerges from Kennaway Tunnel, Dawlish on 31 August 2015 leading 1A83, the 12.01 Plymouth - Paddington. 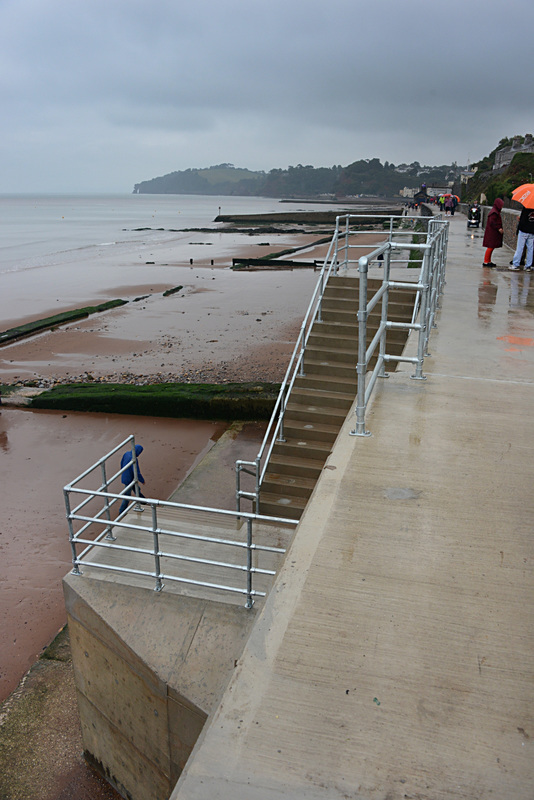 Dawlish on air show day 2015 - 22 August 2015. 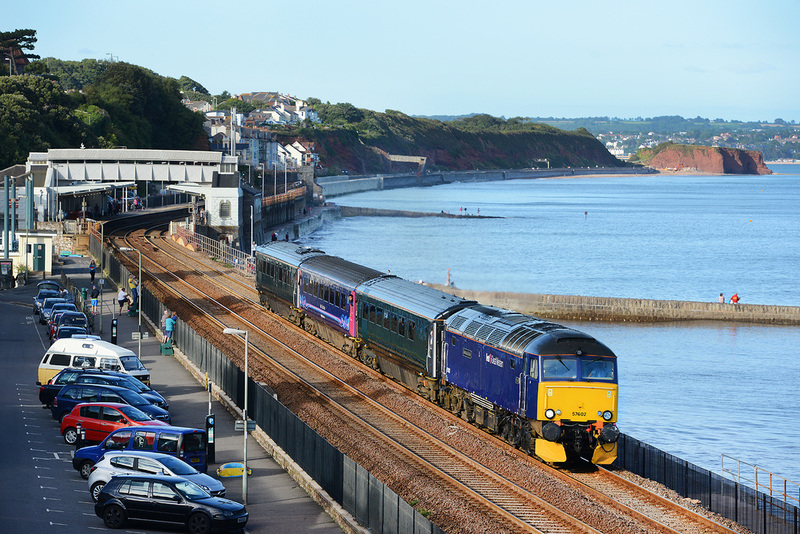 57601 top and tail with 57316 passes Dawlish on 29 August 2015 with the 1Z07 07.06 Chester to Kingswear, note the train is carrying the Cornish Riviera Express headboard, mind you the train was being operated by West Coast Railway, so they likely did not know where Kingswear was! Class 66/0 No. 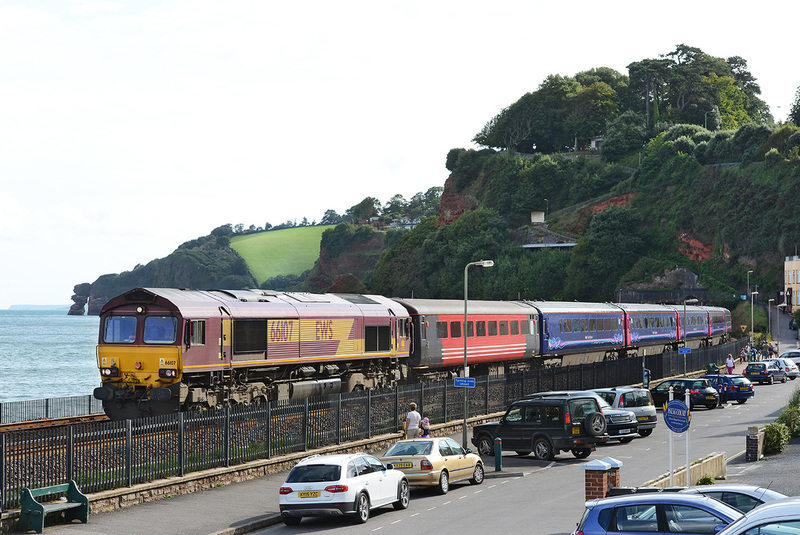 66107 pulls out of Kennaway Tunnel, Dawlish on 28 August 2015 forming stock move 5Z44, 15.35 Laira to Kilmarnock formed of FGW HST vehicles 44093, 42283, 42264, 42098, 40101, 41180, 42347 and 41094 formed between barrier cars 6158 and 5961. 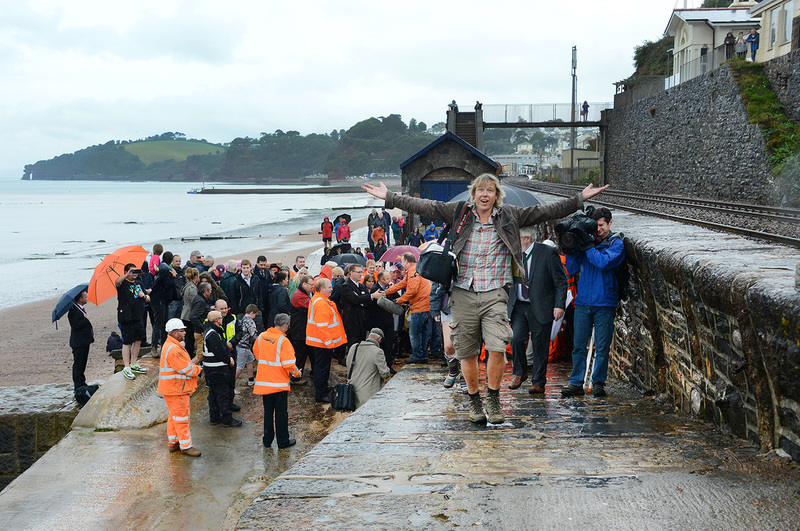 FGW stock move. Class 66/0 No. 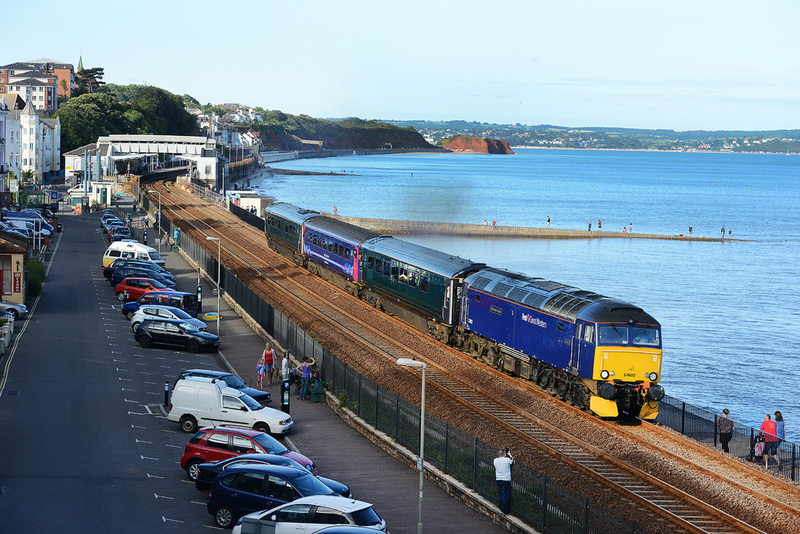 66107 passes Dawlish on 28 August 2015 with 5Z43 the 22.22 Brush Kilmarnock (of 27/8) to Laira depot formed of refurbished HST vehicles 42168, 42565, 42167, 40739, 41167, 44055, 42169, 42348 in a mix of all-over FGW blue and dynamic lines colours. The stock is formed between barrier coaches 5961 and 6158. The 05.17 Old Oak Common to Paddington via Plymouth, New Measurement Train, is seen emerging from Kennaway Tunnel Dawlish on 28 August 2015. The train was formed of 43013, 975984, 975984, 977994, 977993, 975814, 977984 and 43062. 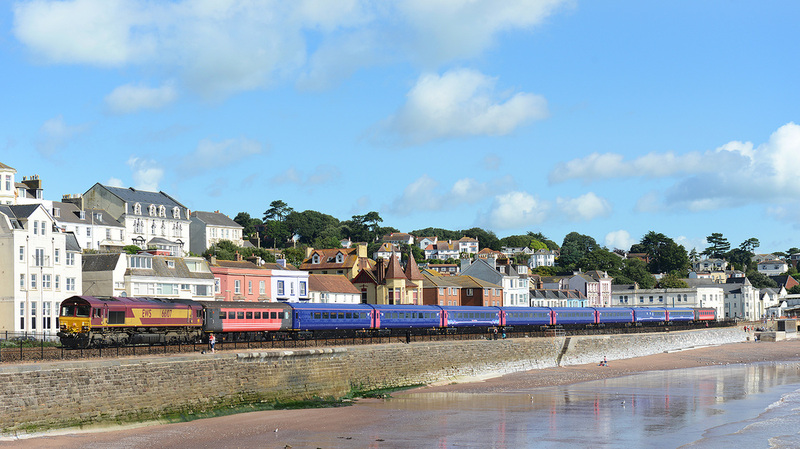 Running 100 minutes early, the 05.17 Old Oak Common to Paddington via Plymouth, New Measurement Train, is seen passing Dawlish on 28 August 2015. 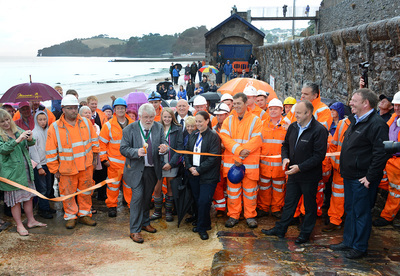 The train was formed of 43062, 977984, 975814, 977993, 977994, 975984 and 43013. 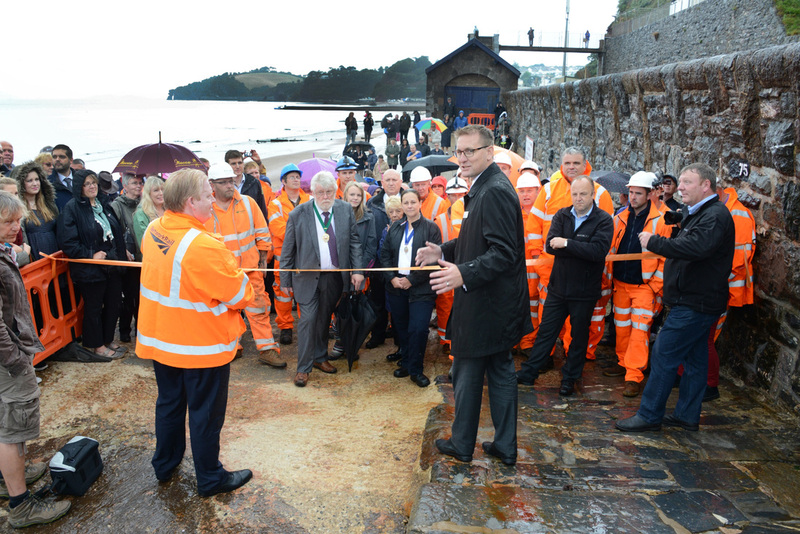 Doubt there will be many more Thursdays in 2015 that 6C53, 15.06 St Blazey to Exeter Riverside will emerge from Kennaway Tunnel to catch the sun by Boat Cove, Dawlish. 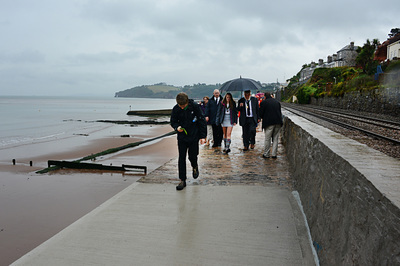 On 27 August the train heads towards Exeter formed of 10 clay wagons powered by DB-branded No. 66176. 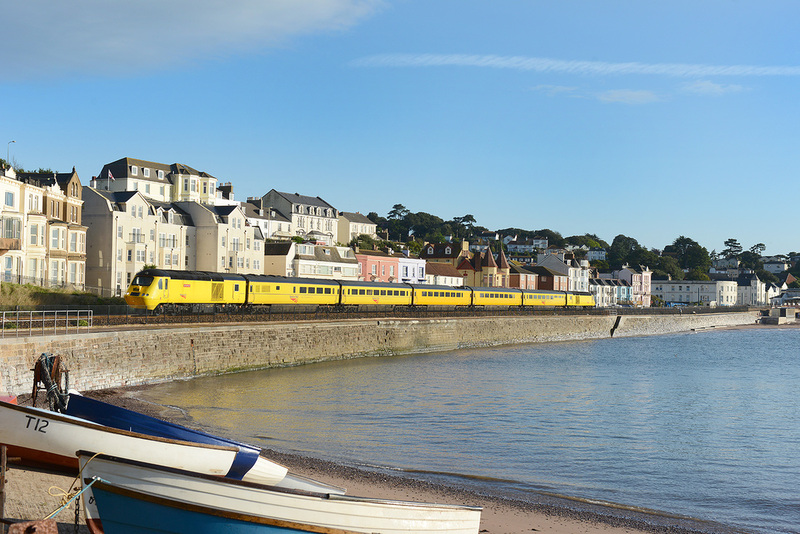 On a beautiful South Devon summer morning, FGW power cars Nos. 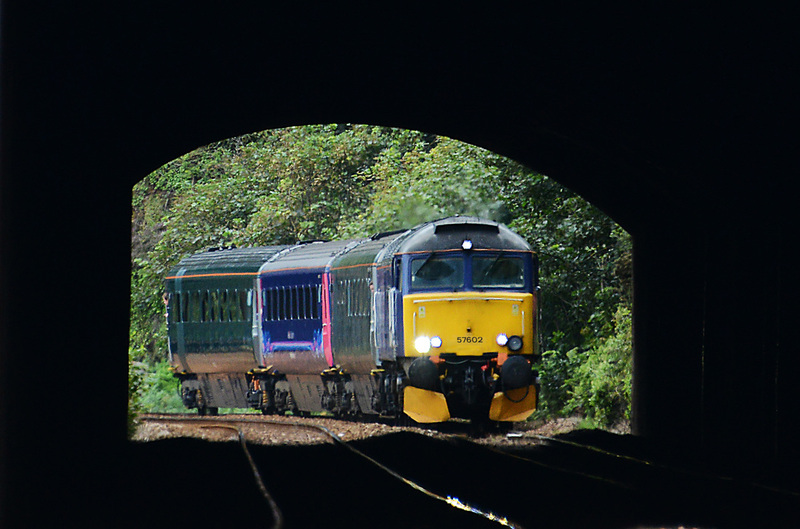 43041 and 43027 emerge from Kennaway Tunnel running as 0Z70 09.32 Laira Depot to Old Oak Common Depot. 25 August 2015. 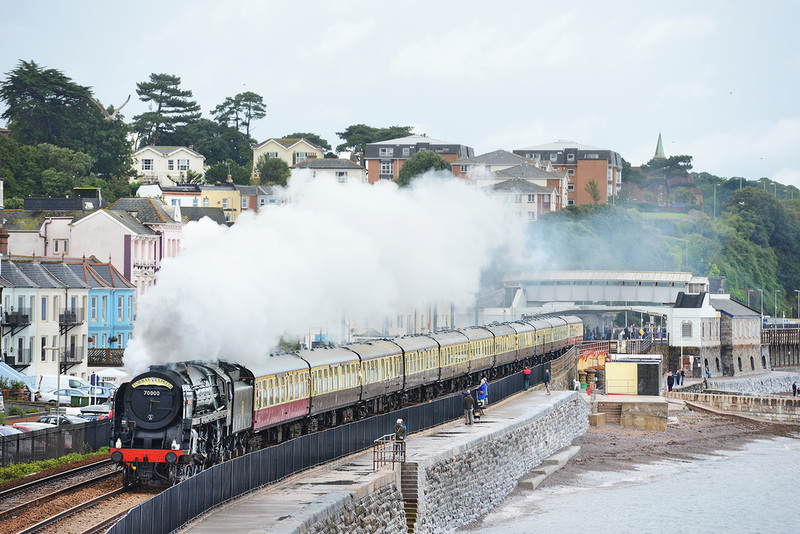 The down 'Torbay Express' on 23 August 2015 storms through Dawlish powered by Class 7 No. 70000 Britannia. The train was running as the 09.15 Bristol temple Meads to Kingswear. 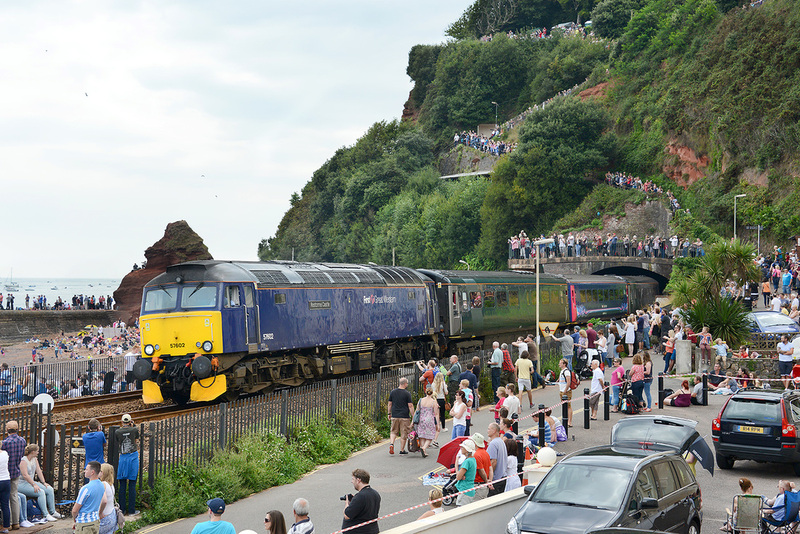 With crowds enjoying the Dawlish Air Show 2015, FGWs Saturday only loco-hauled 13 35 Plymouth to Exeter St Davids emerges from Kennaway Tunnel, Dawlish on 22 August 2015. 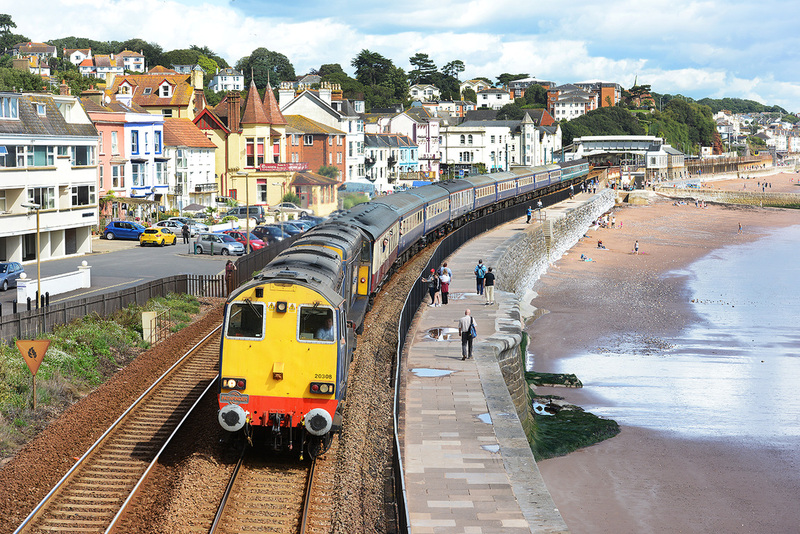 FGW operated a handful of extra trains for the 2015 Dawlish Air Show, operating a 'shuttle' service between Exeter and Newton Abbot. 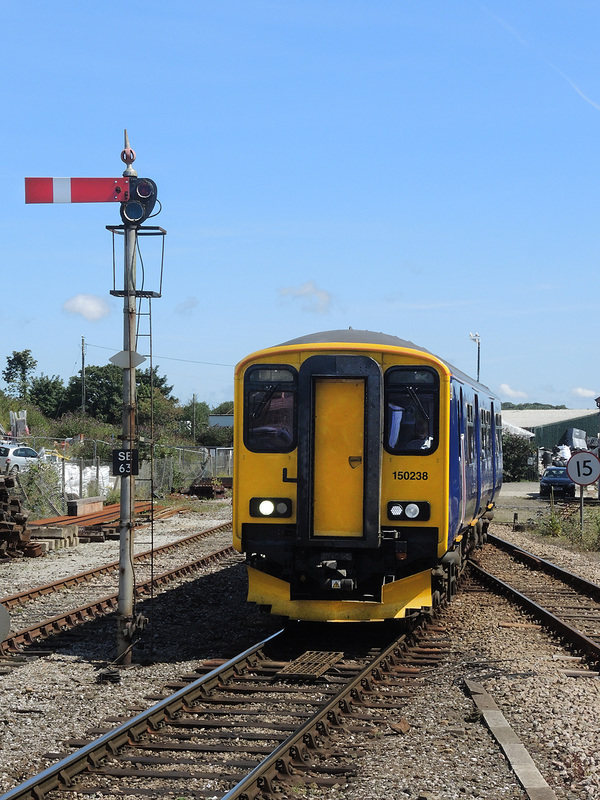 One HST set was used together with various formations of DMU stock. The highlight was the operating of a seven car DMU set, (understood to be the first seven-car second generation DMU in passenger service on the sea wall). 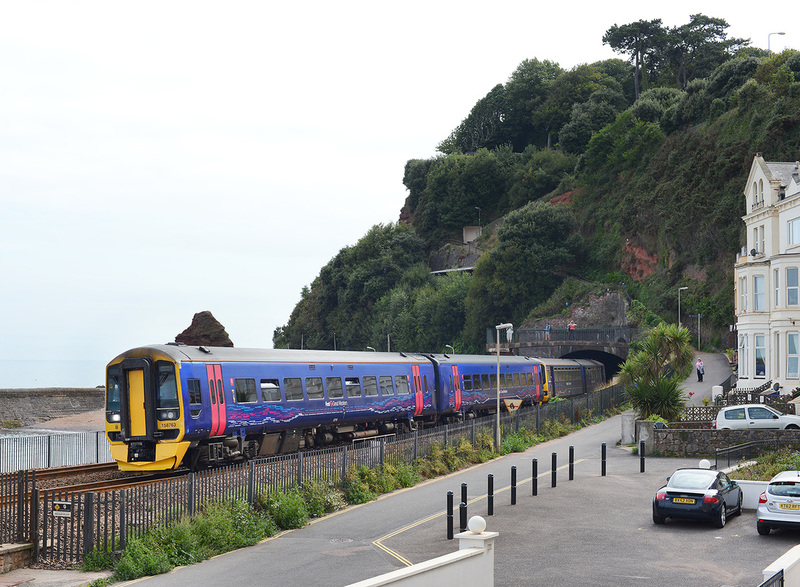 Here the 'long' formation of 150926 + 150261 + 150129 departs from Dawlish formin the 16.23 Exeter St Davids to Newton Abbot. A4 No. 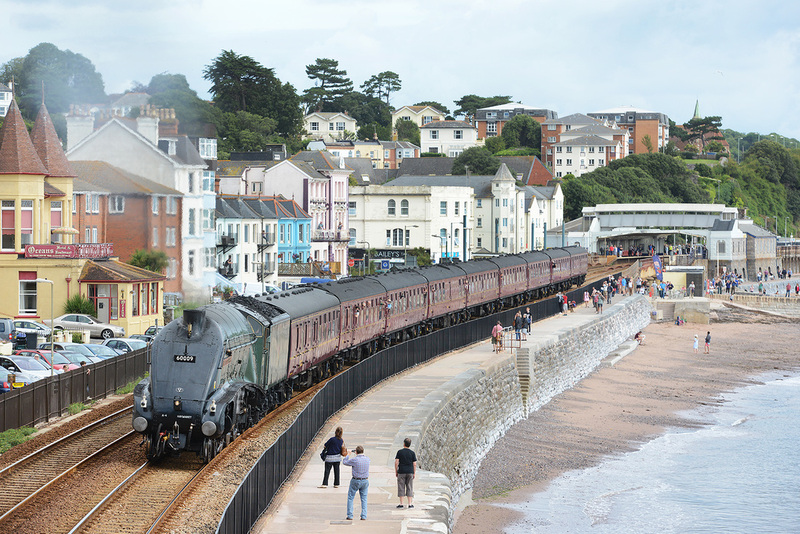 60009 Union of South Africa, pulls away from an unscheduled stop at Dawlish on 16 August 2015 while working train 1Z37, the 08.50 Bristol Temple Meads to Par 'Royal Duchy' Sadly the loco failed at Newton Abbot with a defective big end, and was later transferred to the South Devon Railway for attention at Buckfastleigh steam workshop. 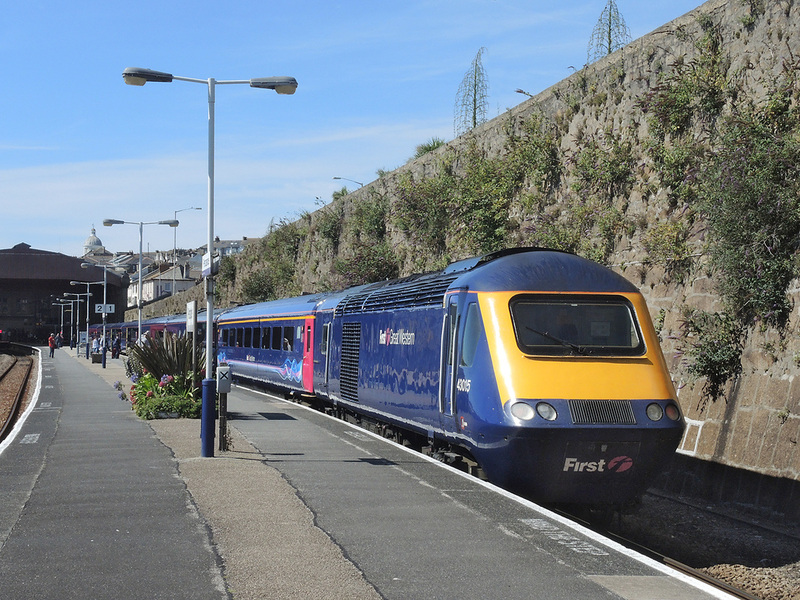 On 15 August 2015, FGW Class 57/6 No. 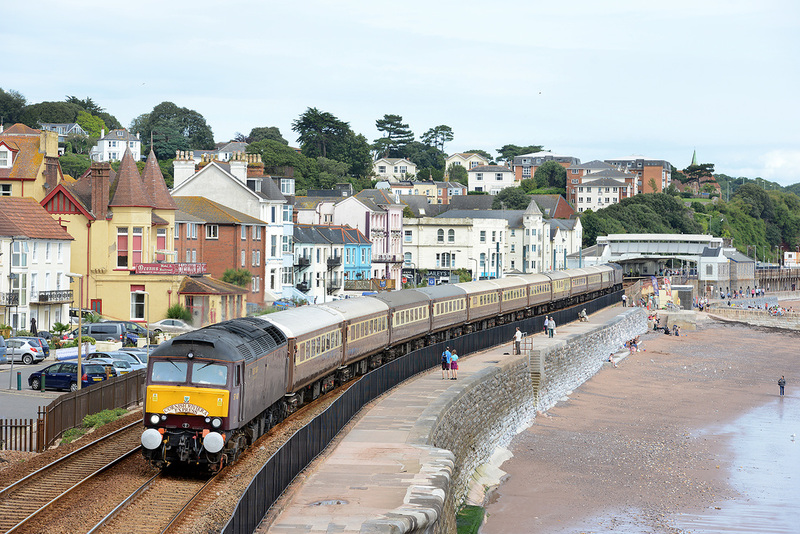 57602 departs from Dawlish with the 17.50 Exeter St Davids to Penzance service. 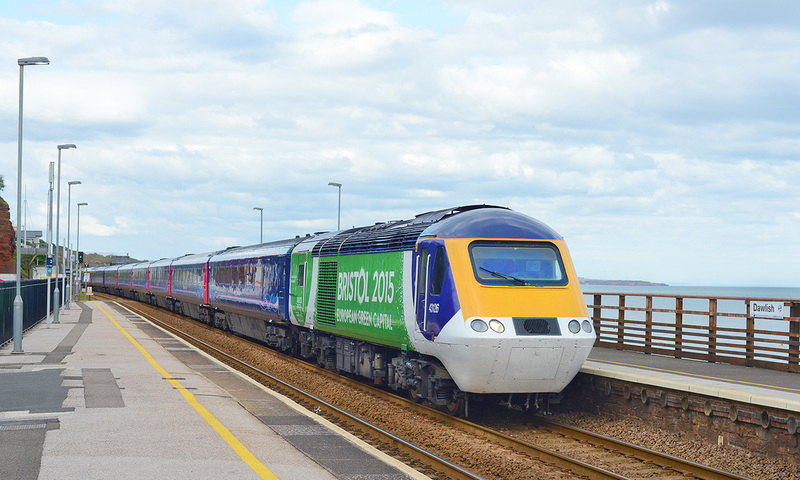 221138 carries 'The Big Hoot Birmingham 2015' branding in support of a Birmingham arts event, passing Dawlish on 15 August 2015 forming 1V56 07.50 Glasgow Central - Penzance. 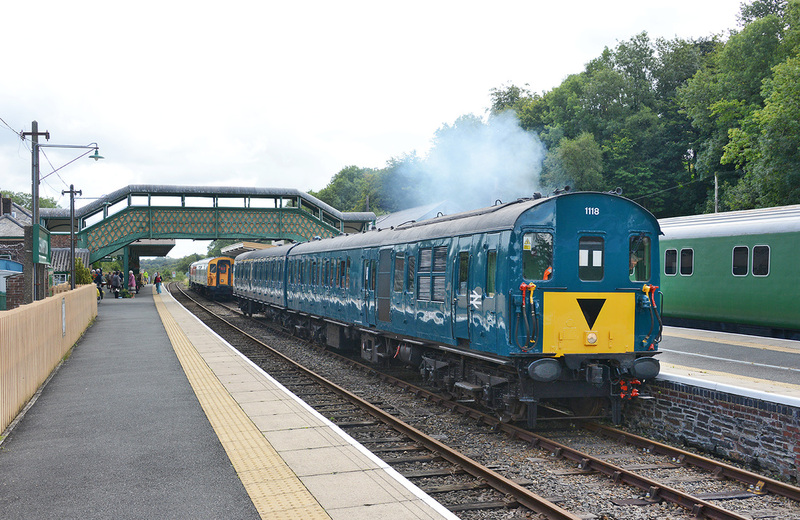 2H 1118 stands at Okehampton with 12.10 service to Meldon Quarry on 15 August 2015. 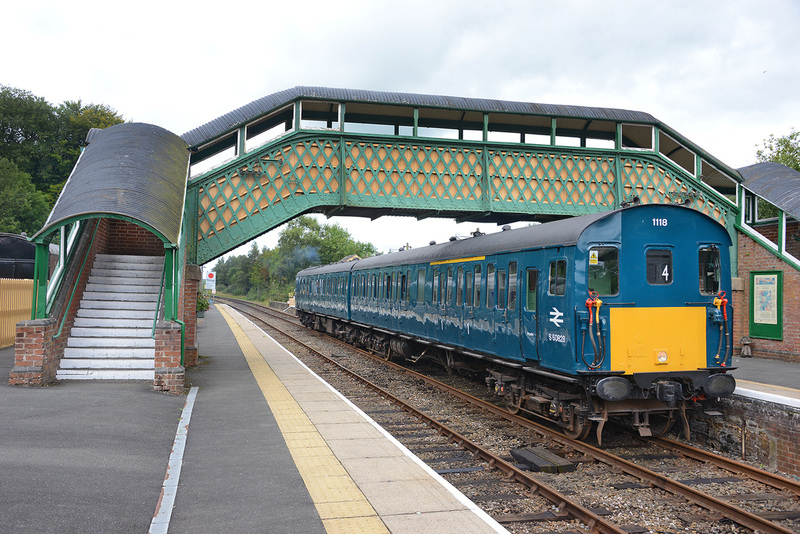 2H 1118 stands at Okehampton on 15 August 2015 with the 11.25 to Sampford Courtenay. 15 August 2015. 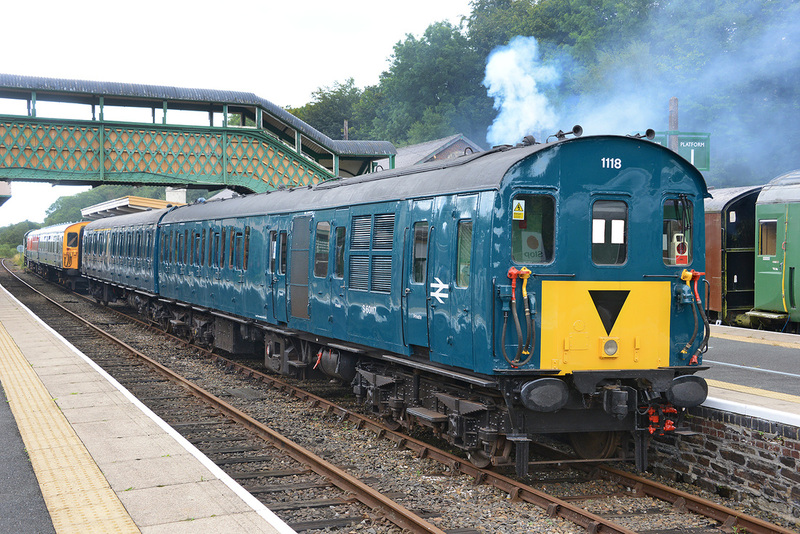 2H 1118 stands at Okehampton with 10.10 service to Meldon Quarry on 15 August 2015. 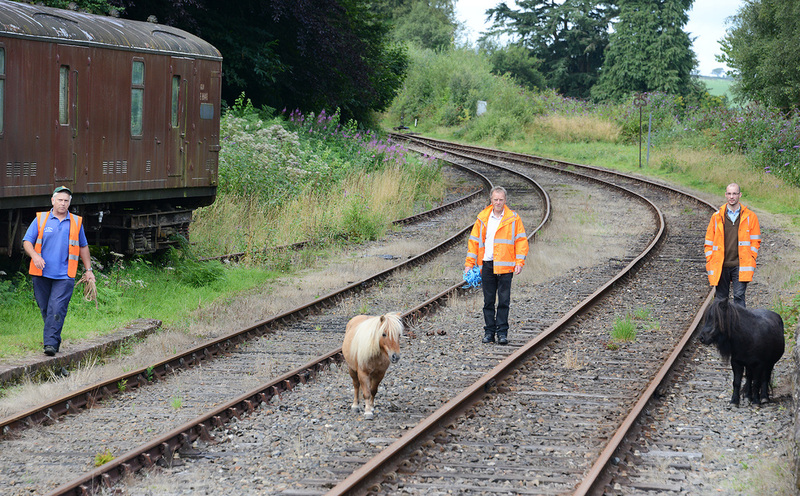 Unwanted visitors to the railway at Okehampton on 15 August 2015. 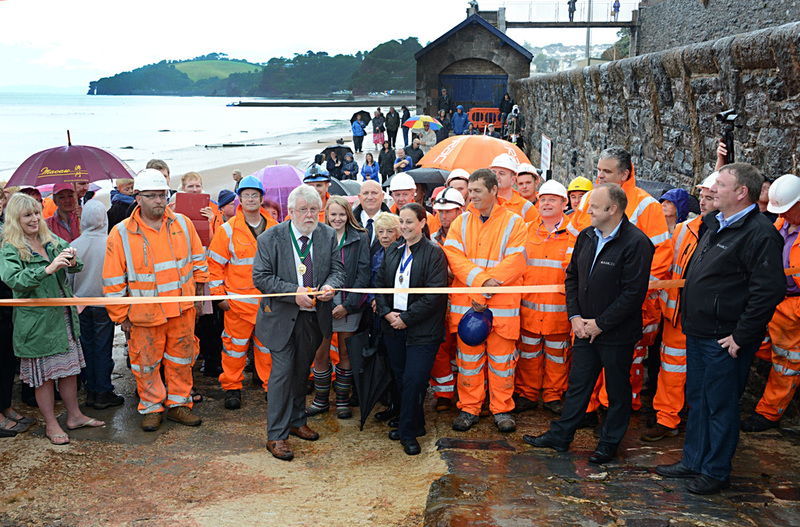 Network Rail marked the completion of repairs to the sea wall walk way at Dawlish, with a community event held in the town on 14 August 2015. Train services were suspended for two months from 5 February last year following major storm damage which washed away both the sea wall and the railway. 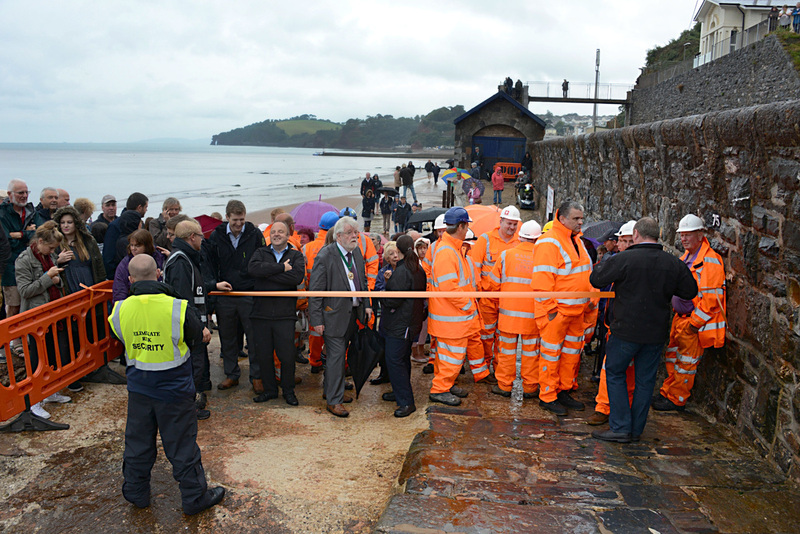 While train services were able to resume in April 2014, work to rebuild and strengthen the sea wall and walkway took 555 days. Network Rail has built a new wall in front of the existing sea wall between Rockstone and Coastguard footbridges to provide further protection to the railway, and has reconstructed the adjacent walkway so that its height is level with the sections on either side, meaning that it will now be accessible at high tide and provide full disabled access between Dawlish and Dawlish Warren. 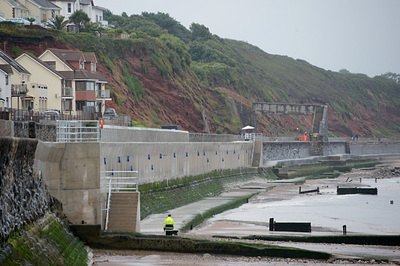 The original low level section was built to meet the demands of land owners in property adjacent to the railway who did not want people walking the wall to be able to gain a view into their property. 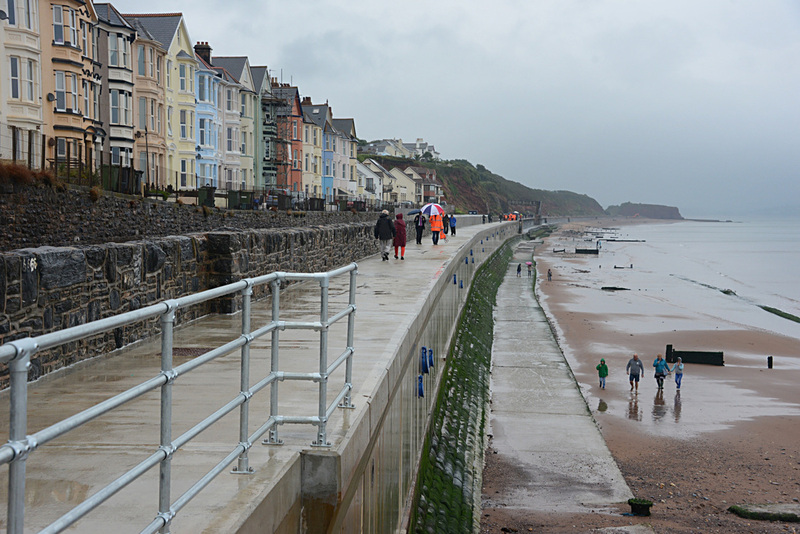 The new walkway also provides new steps to the beach. The official re-opening was hosted by Network Rail with the ribbon cut by the Mayor of Dawlish Cllr Howard Almond. 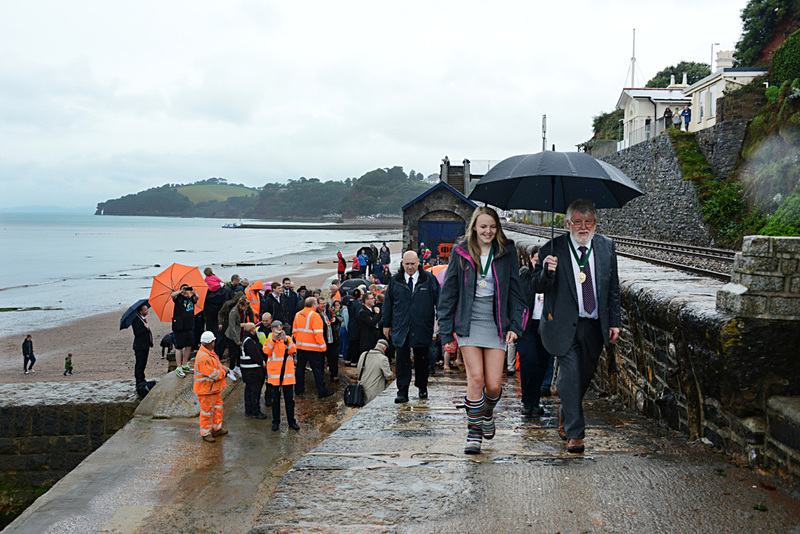 Although the opening day was very wet with heavy rain, some 300 people walked the length of the new wall following the Mayor, invited guests and members of the media. 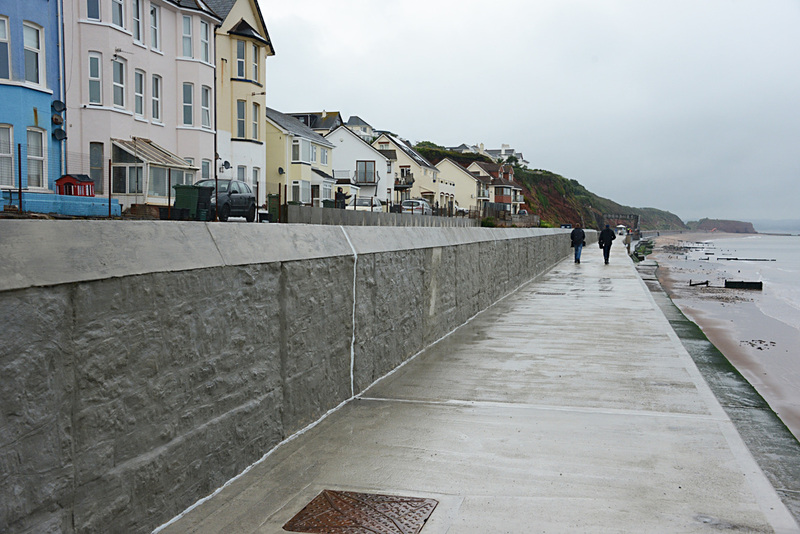 The wall fully opened at 13.00. Luxury traction for the Sea Wall on 12 Aug 2015 when Class 158 No.158763 turned up on the 2T17 13.23 Exmouth-Paignton and 2F41 15.13 return coupled to a Class 143 (143621). 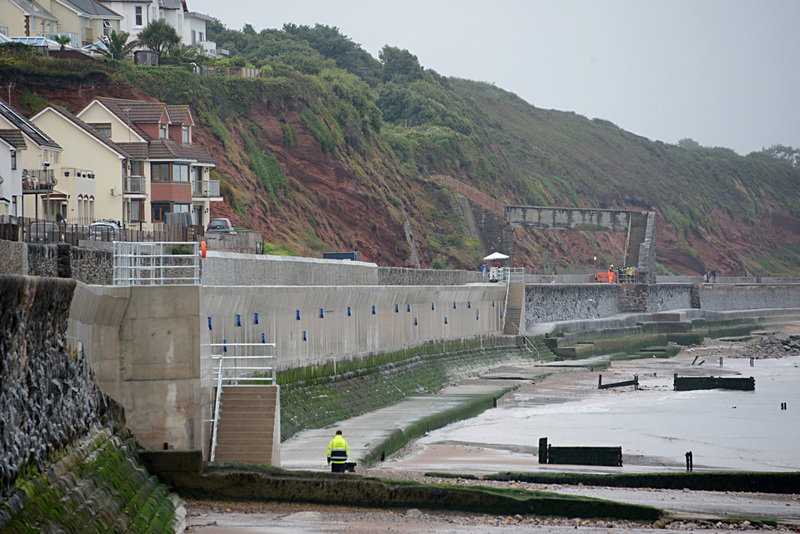 Seen emerging from Kennaway Tunnel. 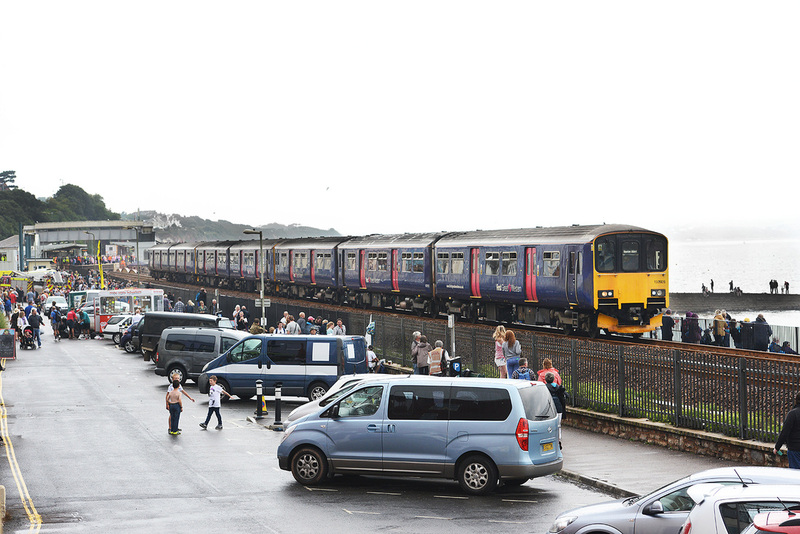 Class 158 on load to cover for overcrowding during Dawlish Carnival week. FGW power car No. 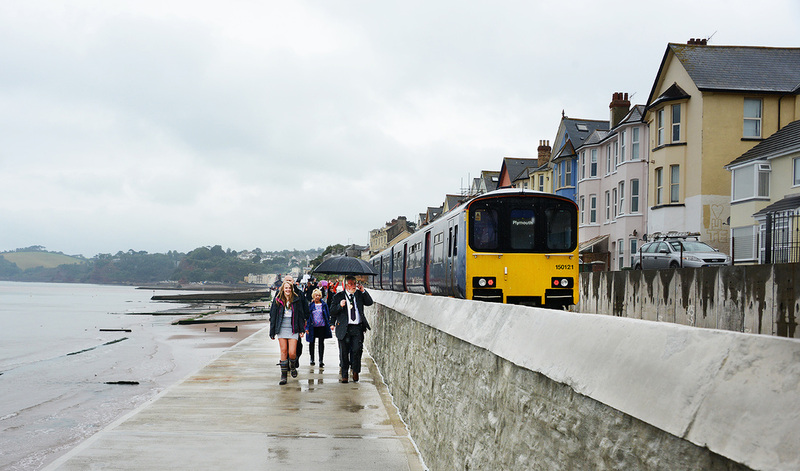 43015 awaits departure from Penzance on 8 August 2015 with the 11.58 service to Paddington. 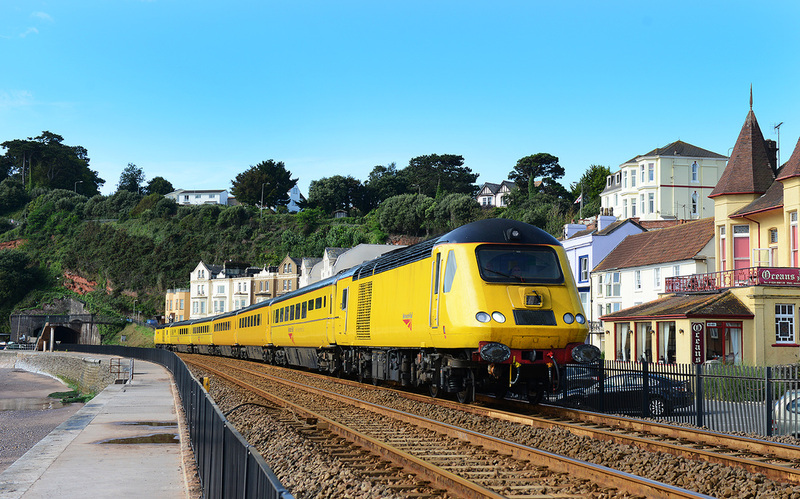 Advertising liveried HST Class 43 No. 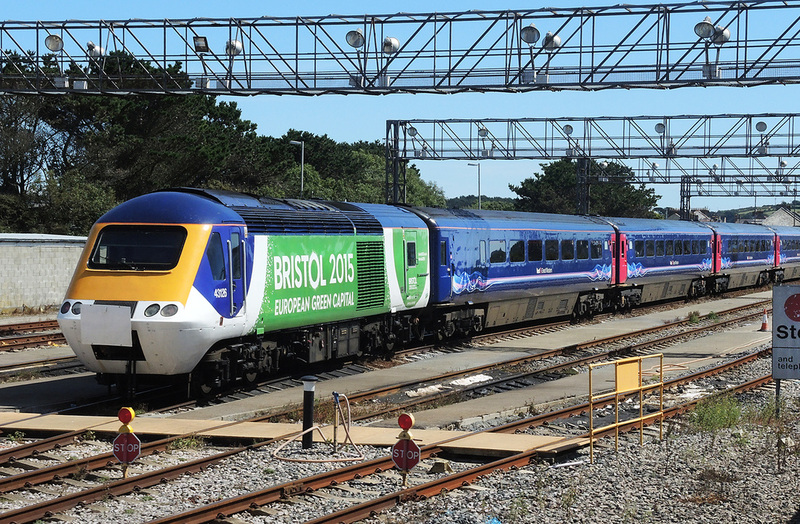 43126 'Bristol European Green Capital 2015' stands with a failed HST set at Long Rock depot, Penzance on 8 August 2015. The train led by power car No. 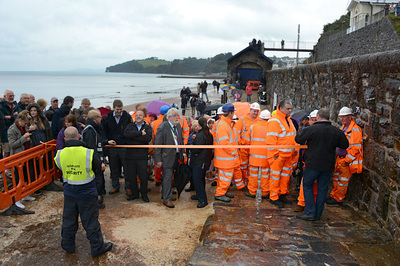 43137 failed the previous day near Probus and was returned to Penzance awaiting hauling to Laira for repair. FGW Class 150/2 No. 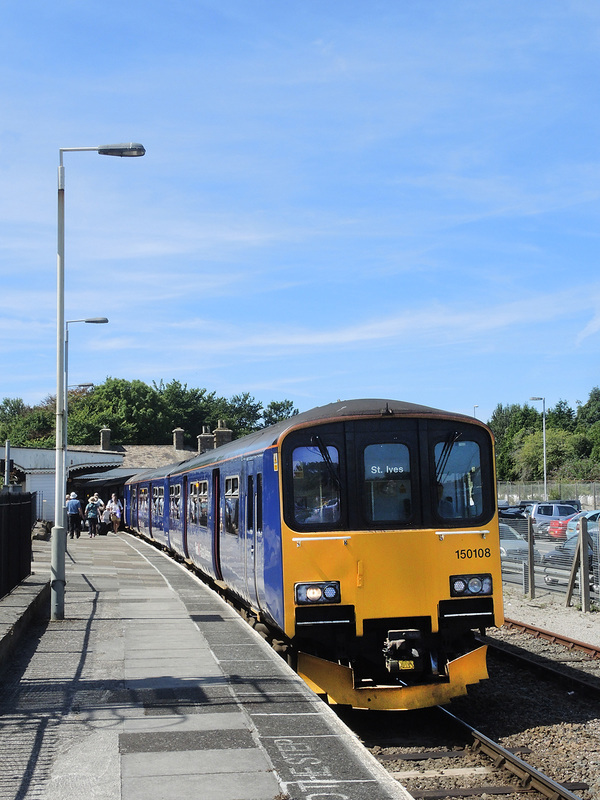 150238 arrives at St Erth on 8 August 2015 with train 2A18, the 12.03 from St Ives. 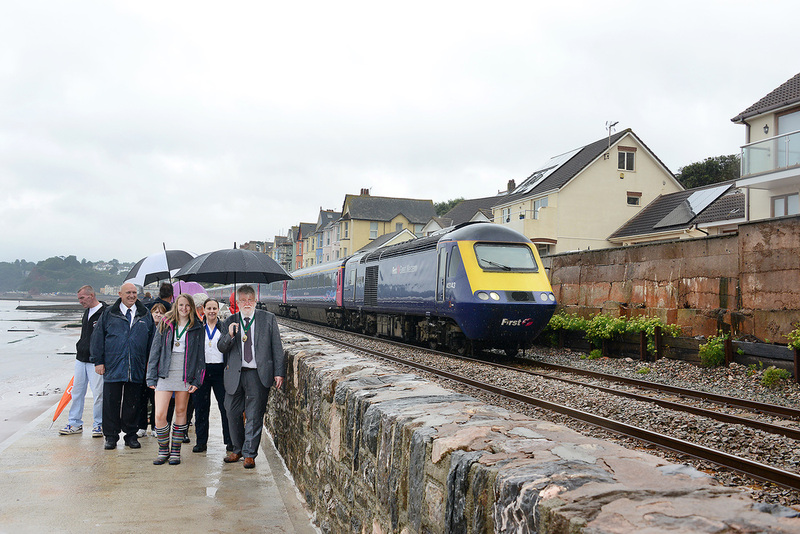 FGW CLass 150 No. 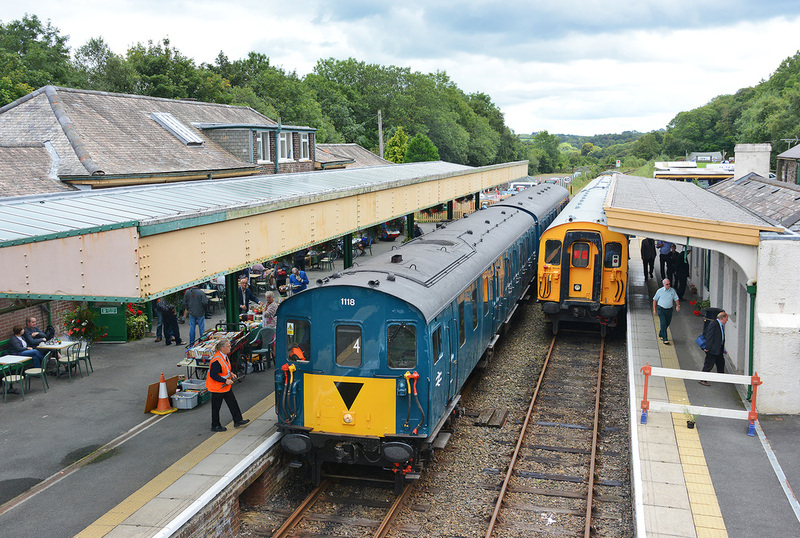 150108 and 150238 await departure from St Erth with train 2A19 the 12.18 to St Ives. 8 August 2015. Class 150/2 No. 150238 departs from St Erth with train 2A33 the 15.48 service to St Ives. 8 August 2015. 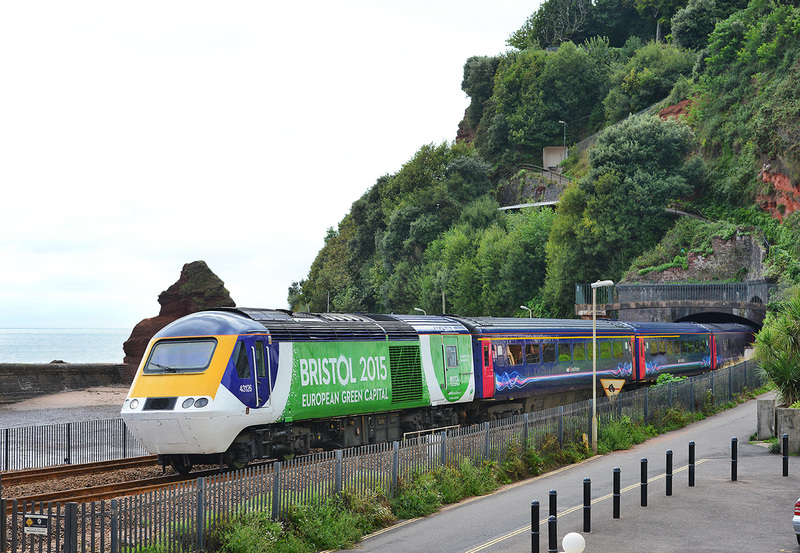 FGW 'Bristol 2015 European Green Capital' power car No. 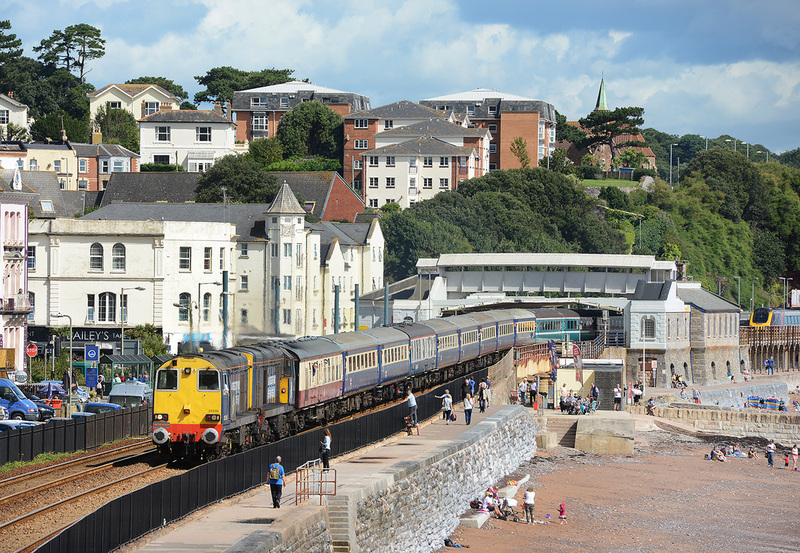 43126 passes Dawlish on 6 August 2015 leading train 1C86, 15.06 Paddington to Penzance. 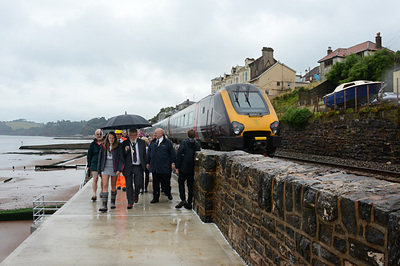 First passenger train run in that livery along the sea wall. 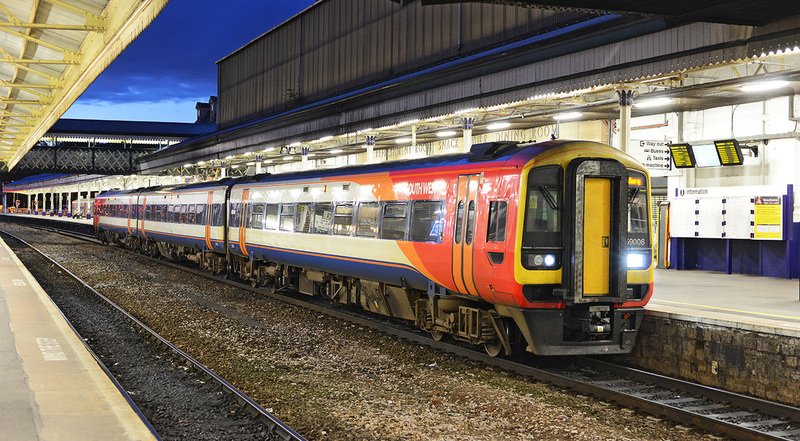 South West Trains Class 159 No. 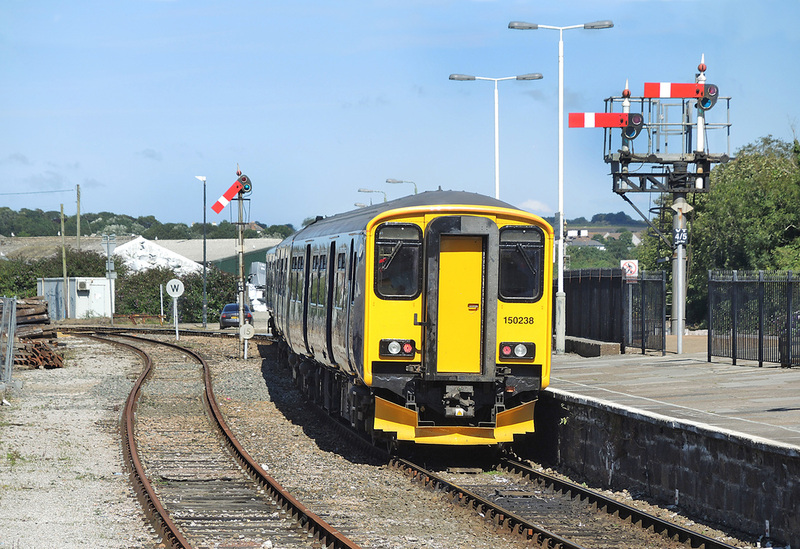 159006 awaits departure from Exeter St Davids on 6 August 2015 with the 21.25 to Salisbury. 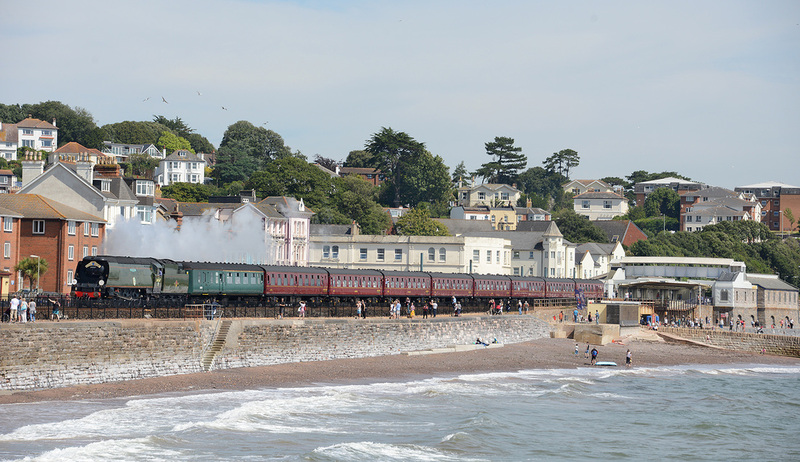 60163 up Dawlish, 2 August 2015, returning Torbay Express, 16.50 Kingswear to Bristol TM. 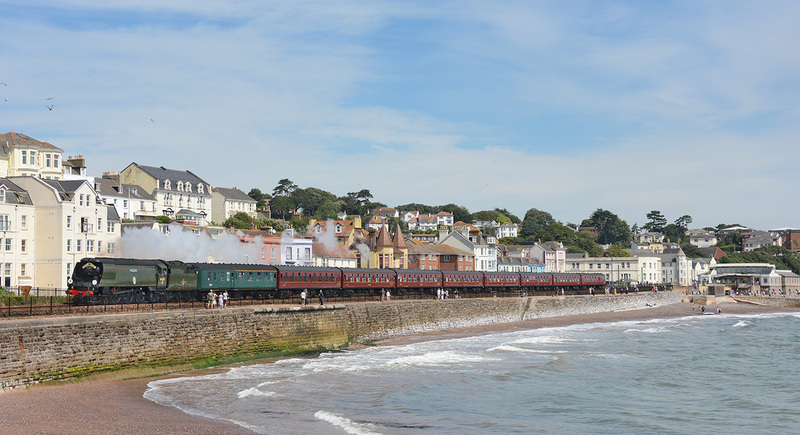 60163 down Dawlish, 2 August 2015, Tobay Express, 09.15 Bristol temple Meads - Kingswear. 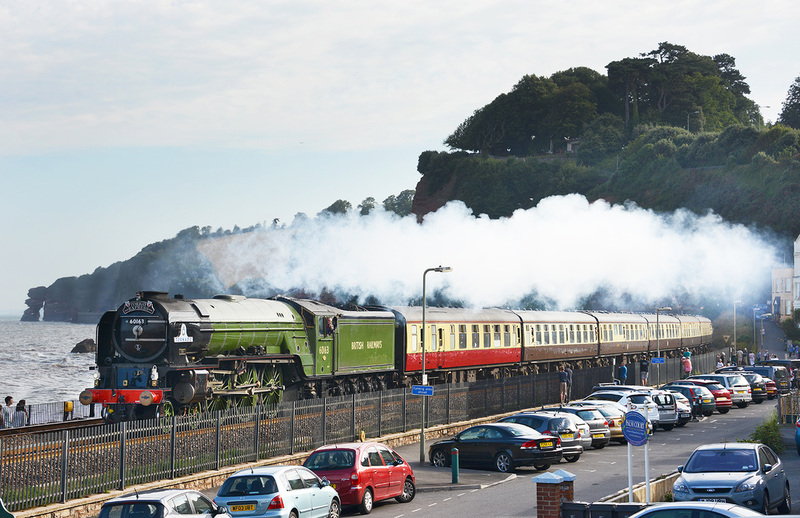 34067 down Dawlish, 'The Royal Duchy' 08.50 Bristol Temple Meads - Par. 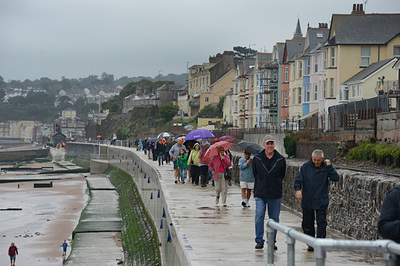 2 August 2015. 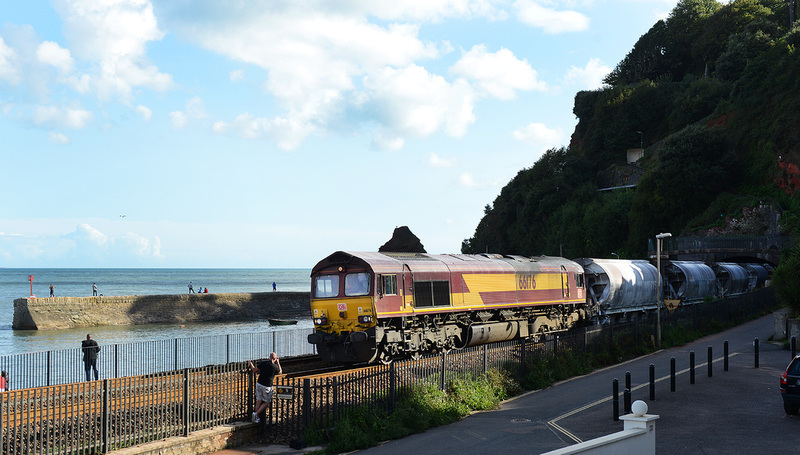 57302 approaches Kennaway Tunnel, Dawlish 1 August 2015, 13.35 Plymouth - Exeter St Davids.